It didn’t take too long. Apparently, Omar has fond memories of the Steve Trachsel era because he just signed his most recent incarnation. I’m sorry Steve Trachsel; let me be fair to you. Tim Redding, somehow, is worse than you were. For a measly $2.25 million dollars, we will have the privilege of 1.5 baserunners on average every inning. Exciting! An earned run in ever other inning. Enjoy! I don’t have a problem with the man himself. I have no doubt that he is trying. But the numbers show that he is a below average pitcher, well below average as a matter of fact (88 ERA+)*. And if Jerry Manuel shares Omar’s flawed baseball strategies, which I believe he does, we can expect to have a bad pitcher pitch almost as many innings as Johan Santana. This is where my real objection lies. I simply cannot understand why it is considered acceptable to have a terrible pitcher as your 5th starter. I understand this guy isn’t going to pitch in the playoffs, should the Mets be lucky enough to make it, and be lucky enough to have the four guys in front of him stay healthy. I understand it is unreasonable to demand 5 aces, unless you are a Yankee fan. But why is the fact that this guy “eats innings” so desirable? Why is it better to have one bad pitcher pitch alot of innings than it is to have a series of prospects, who at least have a chance to be average or better, moving through the role? I would argue that the expected value of the latter solution is much higher, even if we can expect more variance. Not to mention that you could pay ten pitching prospects with the money spent on this below average guy who happens to be durable. *The numbers show that I was truly unfair to Trachsel earlier in the post. Trachsel had a career ERA+ of 99, or almost exactly league average. At least Reddding didn’t give up Mark McGwire’s 62nd home run…I guess? But don’t worry kids, the news isn’t all bad. Not only was Tim Redding among the league leaders in games started, earned runs allowed, and wild pitches, he was also fourth in the league in sacrifice bunts! 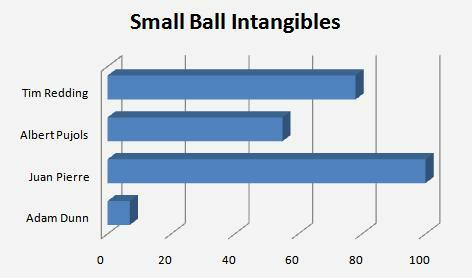 SMALL BALL INTANGIBLES ARE OFF THE CHARTS. If Willie was still managing, he would immediately be declared “one of his guys”. What should Omar do? Let’s be constructive. At this point, Omar simply has to sign Derek Lowe. He is running out of options. I didn’t think this before. I used to think it was too much money and draft picks for a 36 year old pitcher. But as pitchers and catchers gets closer and closer (1 month, 2 days! ), the reality of the Mets slim starting rotation is starting to set in. There is one consistently good pitcher on the market, and it is Derek Lowe. As a side note, it is NOT Oliver Perez. Ollie was a league average pitcher last year. He is not worth the absurd money he wants. The one guy who really jumps out at me as a great option as a “5th starter” is Ben Sheets. I don’t get it with him. Nobody wants him. Last year he pitched 198 innings, had a 3.09 ERA, an ERA+ of 139 . And apparently, people are talking one year deals for $4-5MM. The Mets should offer a deal like the one the Red Sox gave to Smoltz: $5MM guaranteed, $5MM in incentives. Worst case: the Mets eat $5MM. One thing that Bernie Madoff and I have in common is that we don’t care about the Wilpons money. Best case: The Mets have one of the best rotations on the league and a playoffs one-two punch that is as good as most. Are you like me? Not to give the Red Sox too much love, but am I the only one who loves what they are doing with their rotation? They have 8 pitchers who could start, plus the option of moving Smoltz to the bullpen where he was very successful. I love it! They can absorb injuries without suffering too much in terms of quality. Every team with the resources (like, um, THE METS) ought to do this. I went back in the archives to look and see when the last time a team made it through a season with no injuries sustained by the starting rotation and it turns out it was NEVER. Unless failure is acceptable, any system should have redundancy where it is cost effective. Expect pitchers to go down, and engineer the team to absorb it. Please Omar: Heed my call and buy me some pitchers. 2. OH GOD WHY DID YOU HAVE TO BRING UP SMOLTZ OH JESUS COME BACK I’M SORRY YOU SHOULDN’T BE PLAYING BUT IF YOU MUST PLEASE PLEASE DO IT IN ATLANTA. Dude! This is awesome. I’m currently getting psyched up for next Met season, and I’ll be reading your blog every effin’ day until it happens. Also, I’m starting to think you *should* be Omar. No, you definitely should be. Maybe you’re in the wrong business, dude…. Also: I want your dog.